Friends of the Kaw has been protecting, advocating for, and helping people discover the Kansas River for 27 years. Friends of the Kaw is a non-profit organization, founded 27 years ago in Lawrence, Kansas, by a group of North Lawrence residents looking to oppose dredging on the Kansas River, and now acts as a grassroots environmental organization “working to protect and preserve the Kansas River.” For the last four years, the group's executive director and Riverkeeper has been Dawn Buehler. The executive director part sees Buehler managing the daily activities of Friends of the Kaw. Riverkeeper, though? That might take some explaining. The main job of the Riverkeeper is to protect and preserve the river, and Buehler, along with Friends of the Kaw, does that by mediating suspected pollution by working with different agencies to make sure it gets cleaned up or investigated, and holding communities accountable for the health of the river. Buehler has held a connection with the Kansas River which goes back as far as she can remember, growing up in De Soto on a 500-acre crop farm along the river's banks. She's had a relationship with the river her whole life, she says. Looking back on her time on and near the river, Buehler says, she realizes that every time she went through a hardship in her life, she'd go to it to reflect. So, Buehler had a really deep relationship with the river already, but she worked as an accountant for 15 years. 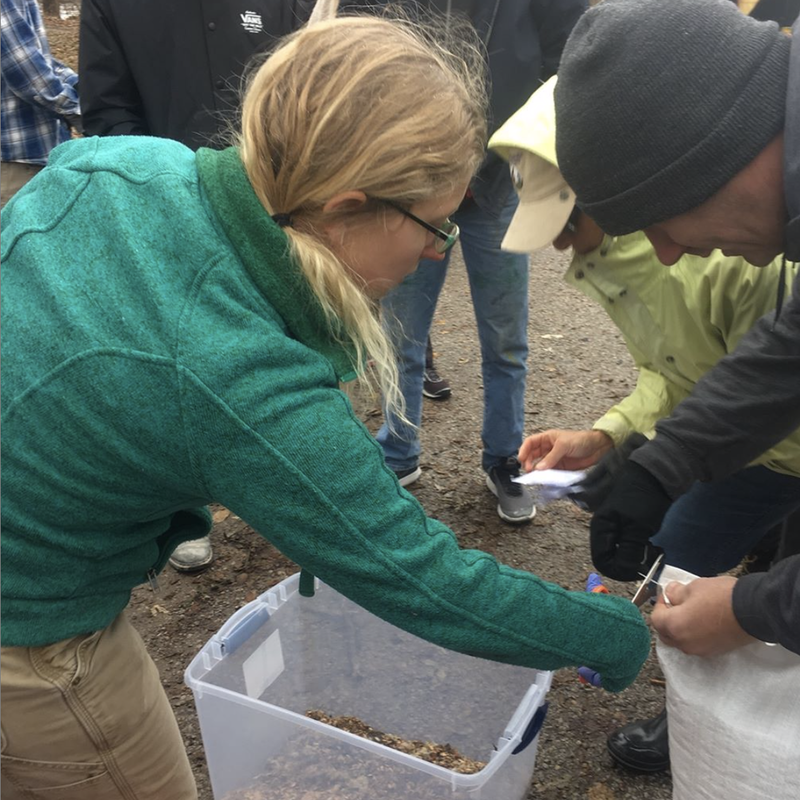 She went back to school to get a Bachelor of Science degree in Fish and Wildlife Conservation, and decided she was going to do the work that she was doing on the weekends. One of those many volunteers is Blue Collar Press president, Sean Ingram, who began showing up to Friends of the Kaw events about a year ago. Once Buehler realized the possibilities of a volunteer with a business like Blue Collar Press, she reached out to Sean, because Friends of the Kaw is an organization with a diverse set of needs. 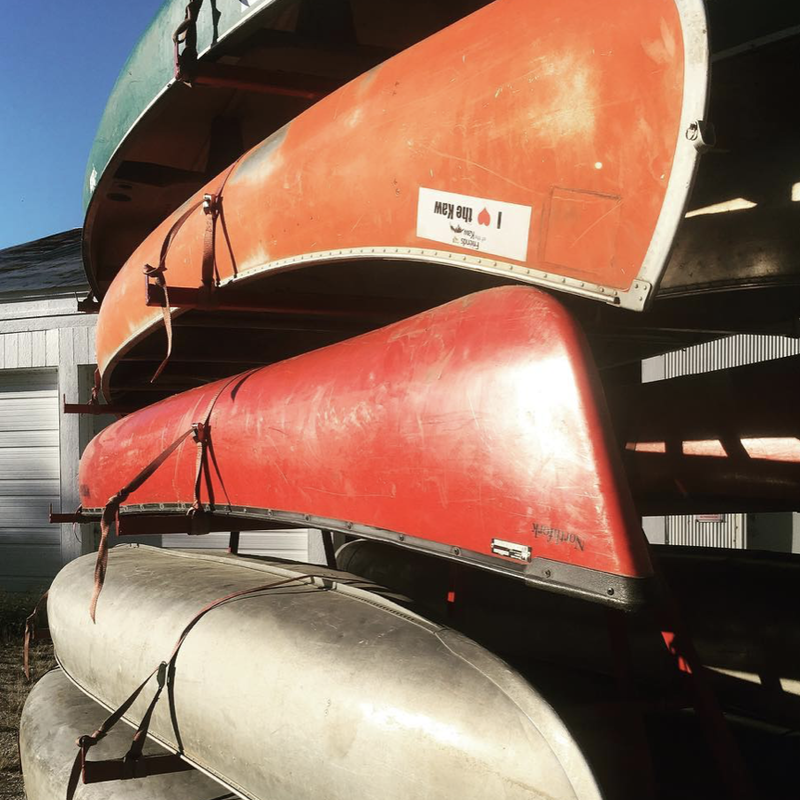 Right off the bat, she says, the press offered to make shirts for the group's Kaw River Guides, who are the volunteers on the river for things like the Friends' regular educational paddle trips. Blue Collar Press debuted a brand-new pop-up concept at the Friends of the Kaw's third annual Beers of the Kaw fundraiser, held at Lawrence's Abe & Jake's Landing in early November of 2018. The company brought screenprinting equipment on-site and made t-shirts, bags, and koozies while people waited, and it was a smashing success – as was the event, which sold out its 650 tickets, and brought in another 150 people in the form of vendors and volunteers. Things look big for Friends of the Kaw: they just hired their first Development Director, literally the day before we sat down and spoke. They've also already announced the next Beers of the Kaw event – November 3, 2019 – for those who like their beer local, benefiting a good cause, and tied to education. Also, with the start of the new legislative session, Buehler has some folks to meet and advocate to. Fat Girl Flow founder Corissa Enneking wants everybody to feel included in her line of custom-designed plus-size clothing. The website Fat Girl Flow is about plus size fashion, but also so much more. As founder Corissa Enneking states on the site, it's the intersection of that, challenging toxic views, sharing pretty things she loves, and triumphs through adversity, among many other aspects. 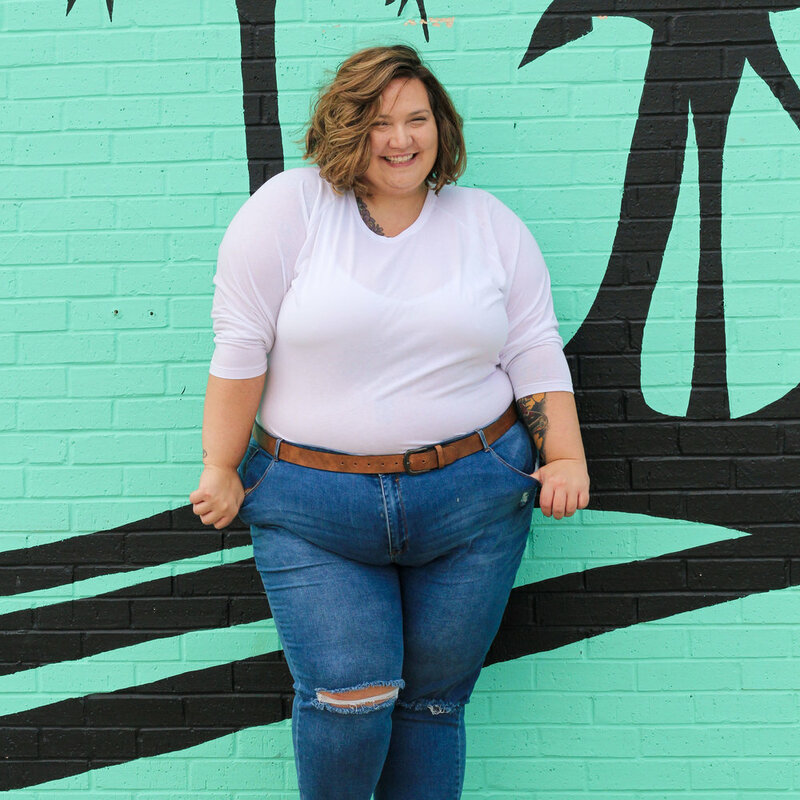 For something that started with Enneking “messing around on Tumblr ten years ago,” as she says, her once-blog, now blog-and-clothing-company, Fat Girl Flow, has grown far beyond reblogging posts. Granted, her not-insubstantial 24,000 followers were nothing to sneeze at, so Enneking's decision to move from the social media platform to her own site wasn't without good reason. Plus, as she says, the timing was right. One of the people whom she'd met on Tumlr was her friend, Joe, who had a hosting company called Accelerated Worpress, as well as a ton of information on how to get started. So, when Enneking made the decision to start blogging, the site's been growing and changing almost continuously since it launched in 2015. It hit the ground running, as Enneking says enthusiastically. About eight months after the Fat Girl Flow blog started, Enneking started a companion YouTube channel. As she researched and followed other channels, she realized that people were doing merchandise for their shows. She started a line of shirts with the Fat Girl Flow logo on them, but quickly ran into a problem. “No-one could find a size over 3X to save their lives,” she recalls with a bit of resignation. They did a small run with another company, and it did all right, but the lack of options was still an issue – that is, until a little over a year ago, when her friend, Mallory Wright, brought to Enneking's attention the possibilities that existed with Blue Collar Press. Still, they ran into the same problem, in that sourcing shirts above a 3X or 4X was a difficulty, and even the shirts that they could find were boxy, unisex styles that were definitely more functional than fashionable. “I'm not saying that a unisex shirt doesn't have its place – they're great, and I think a lot of people get a lot of use from them,” Enneking points out, but she goes on to explain that her audience was not loving it as their only option. So, from there, it became fairly apparent that there was a need for Fat Girl Flow to create their own line of t-shirts, from the ground up. Enneking says that it's less a matter of things being difficult, and more a cyclical aspect of the fashion industry not being willing to take the step of making clothing for the plus-sized market, because they don't think the market will buy them, then when they make substandard things, the market doesn't buy them, and then the argument starts all over again. “You really have to let people know that you're doing this for them, and that you have their best interests in mind,” she explains, offering up a counterargument to the usual suggestion that people should just buy what's available and be happy with it. To that end, she met with Sean Ingram, and he got in contact with designers behind the iconic American Apparel tees, and explained the unique opportunity that Enneking and her idea represented. Also cool? The absolutely inclusive aspect of the Fat Girl Flow brand. In addition to the Fat Girl Flow logo tees, crewnecks, and croptops, as well as FGF Basics line, which offers up perfect tees, raglans, and croptops, there's the amazing Pronoun Packs. These offer up an enamel pronoun pin, several stickers, including a "Hello My Pronouns Are" sticker, a “Break the Binary” sticker proudly representing the trans flag colors, 20 “Hey friend, you misgendered me” cards, and an “ask me about my pronouns” button to get the conversation started. 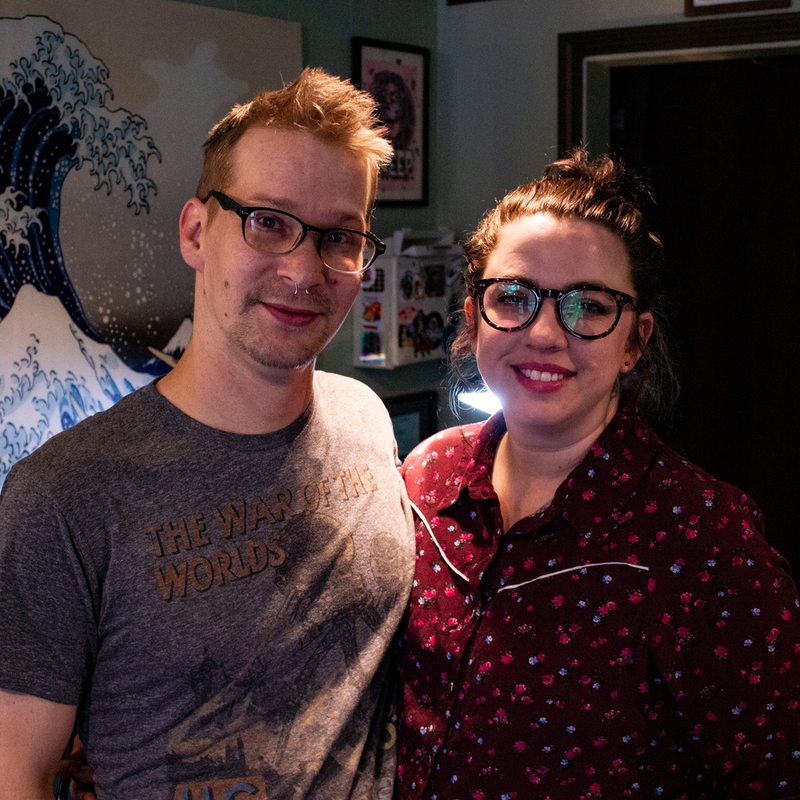 Standard Electric Tattooing's Jarod and Holly Hackney make pulp comic ink come alive on the skin of their clients. Jarod, thanks to an early mentor, ended up falling into black and gray. He'd worked at several different establishments in Lawrence, Wichita, and Overland Park over the eight years before the couple opened Standard Electric in August of 2016, but he credits his time at J. P. Cruise Professional Tattooing in Wichita, and the shop's owner, Josh Cruise in really helping him find his particular niche. He brings up the fact that he had always been an all-around guy, prior to that experience, taking all the simple tattoos which walked in the door, but he quickly realized that the easiest tattoos are also the easiest to do wrong. Holly, prior to apprenticing under her husband, had worked in education since she was 19. She quickly learned that working for the school district, opening a new business, and apprenticing – to say nothing of the couple's three children – was more than she could handle. She says all of this with a smile and a laugh, and you can tell just how much the couple enjoys working together after just a couple minutes sitting with the pair. 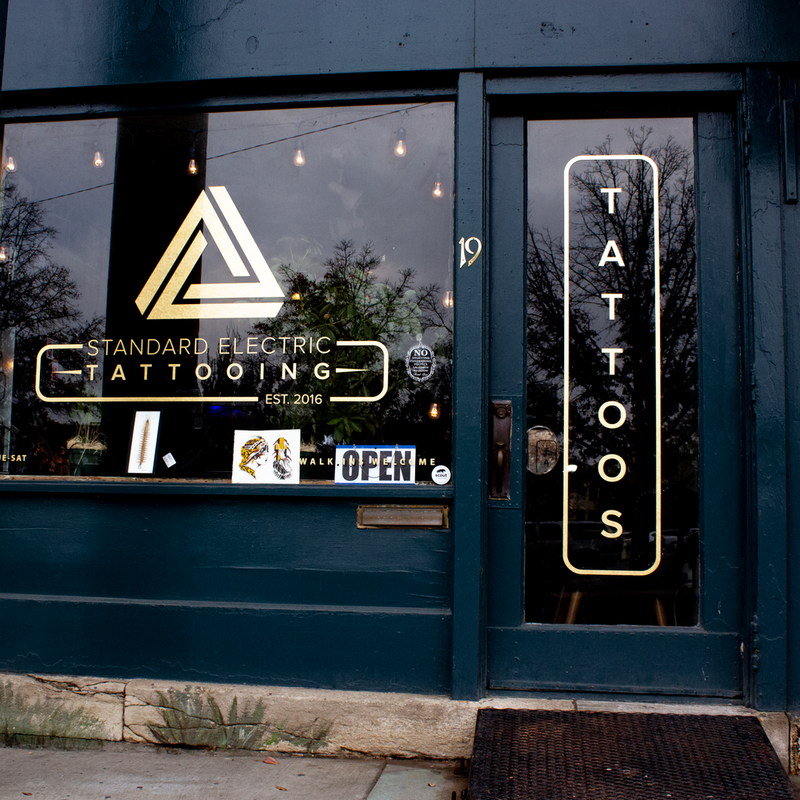 It's a good thing, too, because taking on their own business was a real learning experience, especially for Jarod, who'd always worked in a shop wherein all he had to worry about was coming in and working at tattooing. Sorting out the practicalities of the shop on the tattooing side was easy, because the pair knew what they needed on that end – gloves, ink, disinfectant wipes, and so on – but things like tape? Who knew you needed to buy tape? “Working in a big shop, you can just bounce around and it's like, 'Dude, you got those medium gloves for me?' offers Jarod as just one example among many of the things beyond one's personal station that become something to consider when you're the boss. Thankfully, one of the things which happened a little more smoothly was when the Hackneys decided to order their shirts from Blue Collar Press. A prior experience with a different press shortly after opening Standard Electric had resulted in less than stellar results, with the design looking fine on smaller sizes, but when blown up to extra-large, it ended up being unfortunately small. They point to the fact that the Bourgeois Pig, just down the block, has really wonderful stickers, and an inquiry into who'd made them was the Hackneys' first introduction to the Blue Collar name. So, when it came time to order their next set of shirts, they had a name and a sense of quality to start with. Holly credits the online ordering process on the Blue Collar website as being a breeze and helping make their second batch of shirts far more appealing. “I just shot over an email, and I shot over our design,” she says. It helped that the Hackneys knew what shirts and colors they wanted, thanks to really doing some research on their end, but the ability to email a local company with everything they wanted, approving the price, and then receiving an invoice and a timeline as being wonderfully easy and simple. “[Blue Collar] made it really painless,” Holly concludes. She reaches under the desk to pull out a tri-blend t-shirt so that we can ooh and ah over how nice the shirt looks and feels. The experience has been so positive, the pair is looking to using the press for future merch, like stickers and enamel pins. While they offer up free buttons to clients, they'd like to have something a little more fancy. Although Dave Derr and his wife, Jessica, have been cooking together since 2001, their sausage-making business has only been around for six years. Originally started in 2012 as the Wiener Wagon, a cart which would appear at the Overland Park Farmer's Market and the occasional special event around the JoCo area, the couple opened a storefront location – Wiener Kitchen – in December of 2017. They had some free time, so they figured, “Let's fill this up with a hot dog cart, just to see what happens.” Of course, Derr says, it was possibly the worst time to start a project like that – their four kids were all still really little, and they were also redoing their kitchen. Derr says that at the outset, the couple had no purpose, but they did a few small events like a carnival and the Pendleton Heights homes tour, and steadily stair-stepped upward after their first appearance at the farmer's market later that summer. Derr attended Johnson County Community College, as part of their culinary arts program, and during their garde manger class, wherein students learn the art and science of a cold kitchen, sausage-making was one of the weeks. Derr would belt out links for dinners at the golf course restaurant he and his wife both worked at, or at home for a cook-out, and it was just something he never let go. Once the available teaching hours at his regular job started to wind down, he voluntarily stepped aside to focus on the family-owned Wiener Wagon, and now also, Wiener Kitchen. While there's now a brick-and-mortar location open year-round, it's not changed the fact that the business is very local. Derr's daughter can ride her bike to the shop from her house and the farmer's market – where the Wiener Wagon can be found every Saturday, from April to November – is just 3-4 minutes down the road by car. In addition to growing the business's locations, the offerings have increased from Wiener Wagon to Wiener Kitchen. While those early days might have seen only Italian sausage and bratwurst on the menu – as well as the unlikely turdurcken (a combination of turkey, duck, and chicken) – the Kitchen's menu sees bacon sausage, chorizo rojo, jalapeno cheddar kielbasa, and a vegan dog, among others, as well as a constantly-rotating menu of seasonal offerings. The food is amazing and delicious – everything's made from American Homestead Natural Meats pork and chicken from Gerber’s Poultry – and the folks in the kitchen have paired the right sauce to put on your sausage, no matter what you order. The bacon sausage comes with homemade country gravy, for instance, and if Jessica's behind the counter, she'll even help you pick out the right kind of Jarritos soda to drink with it. A way in which the Derr's product line has expanded is that not only does the store carry a wide variety of their sausages, along with drinks and homemade chili or gravy, but customers who walk into Wiener Kitchen can also snag some local and regional products to dress up that meat. He points to the cold cases along the opposite wall, which feature locally-made cheeses from Skyview Farm & Creamery out of Pleasanton, Kansas, and Hemme Brothers Farmstead Creamery of Sweet Springs, Missouri. Both are producers who've been alongside the Wiener Wagon at the farmer's market for years, as well as Teabiotics, makers of the kombucha nestled next to the Lost Trail root beer. Of course, what local sausage shop would be complete without a t-shirt to show your love? While maybe not as attention-seeking as shirts claiming to be “Best of the Wurst,” the Wiener Kitchen tees are nicely done, with logo work by Blue Collar Press from the get-go, going back to the original hot dog on a fork for the wagon, as well as the new Wiener Kitchen baseball-style version. There's even a neon version of the kitchen's logo for an upcoming shirt. While the Derrs don't have an actual neon sign, folks can brighten up their wardrobe with one on themselves, which the shop's owner really digs. The Raven Book Store works to make Lawrence the “culture capitol of Kansas”, resisting the notion of flyover country. Tucked away on a side street, just around the corner from downtown Lawrence icon Liberty Hall, The Raven Book Store has been the city's independent “purveyors of print on paper since 1987,” as the shop's Twitter bio cleverly states. However, owner Danny Caine took over the store at 6 E 7th Street just a little over a year ago, when he purchased the longtime establishment from owner Heidi Raak. However, it wasn't the start of his time with The Raven, as he'd been an employee of the store for several years prior. Caine's ownership of the store comes down to what he describes as a combination of a lifelong dream to own a bookstore and a little bit of dumb luck. 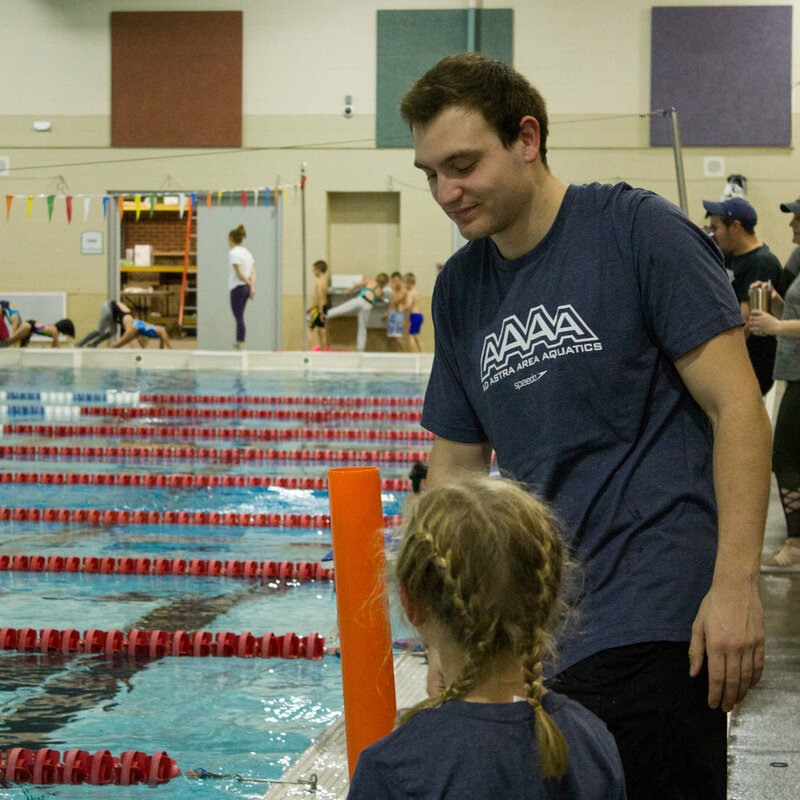 Caine actually had a teaching career – high school and college for nearly seven years – and he learned through various ways, at various times, that it just wasn't for him. So, he came to Lawrence to attend the University of Kansas in pursuit of an M.F.A. in poetry, and immediately started trying to get a job at The Raven. “I moved here, Lawrence was cool, Lawrence had a small bookstore, I knew somebody who worked here, and I started this campaign,” explains Caine of his goal to work in the sort of place he'd dreamed up growing up in a Borders town, where the only bookstore was the big chain. “It took about six months to convince them that they even had a job opening, and that I was a good person for it. Caine worked at The Raven for two and a half years, and as he lost interest in teaching, he started becoming more interested in the book business. He took on more and different responsibilities and looked into different aspects of bookselling as a career. Then, one night, Raak made an offhand joke about selling the store to Caine. Then, as jokes sometimes do, it turned into something serious. It took Caine a lot of research to determine whether or not it made sense – whether he could afford to take it on, whether it would be a viable business, and so on – and after nearly a year, he decided that this was his chance, and he took it. One of the notable changes during Caine's time at The Raven – aside from more shelves and fixtures around the store since he took ownership in August of 2017 – is that, while the store has always hosted readings and visits from local, national, and international authors and poets, they have certainly ramped up over the last couple years, both in terms of number and visibility. He points to a partnership with Liberty Hall as being a large part of it. While The Raven has always done library events at the Hall, they've recently begun putting on their own events there, teaming up with The Commons at KU. To say they've gone well is a bit of an understatement. Caine hopes numbers like that will make Lawrence the culture capital of Kansas, and for folks to view Lawrence as a Midwestern literary hub, not unlike Iowa City. As he says, the city has the authors, the audience, the book store, the facilities, and the energy. “I would love for people to see Lawrence as a city where cool literary things are happening,” he explains. 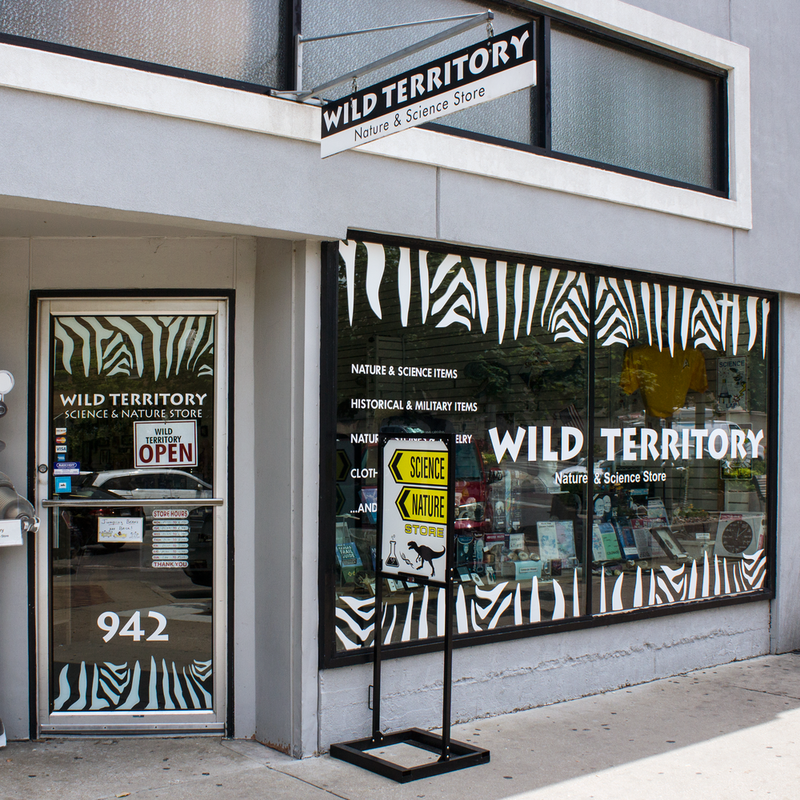 It's definitely a possibility, and we discuss various other bookstores in middle of the map – Iowa City's Prairie Lights, Denver's Tattered Cover, and Austin's Book People – as shops which offer up examples of how it's happened elsewhere. Bringing in authors and sponsoring events around Lawrence is definitely a way to develop the community both in general, as well as one related to The Raven itself. It's important to do these community events, Caine says, but there's also a practical element to everything the bookstore does. In addition to the thousands of books which populate The Raven's shelves, you can also take home items which demonstrate your love for the store. There's the usual – what's a bookstore without a tote bag or coffee mug? – as well as “Make America Read Again” hats, which the owner can be seen wearing most times you spot him. 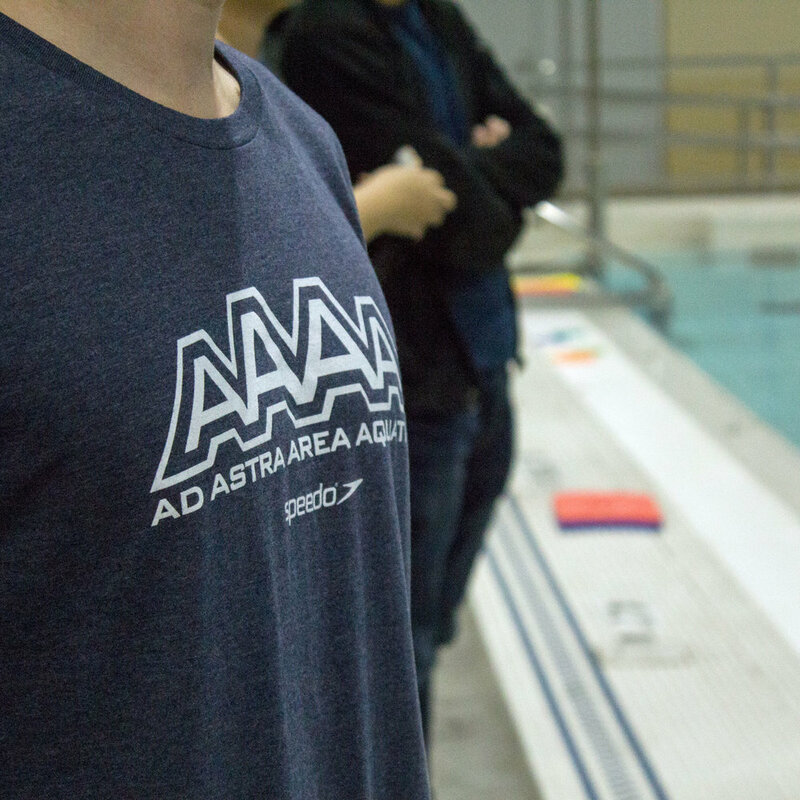 Caine has also increased the number of t-shirts options available, and he's done it in an interesting way. “Beyond mugs, The Raven had never done merch before I took over,” he explains. He's designed all the merch, except for their most recent shirt, which features an image of the store taken from Kevin Cannon's Midwest Indie Bookstore Map. There's also what Caine calls the “retro” design, which looks like an old physical education shirt from the '70s. That's where things get clever. The store printed a limited run of shirts on red and gray as a test when Caine took over, so whenever he sees one of those colors, he knows he's looking an OG, early-adopter Raven customer. It's another example of just how hands-on he is in terms of deciding what merch goes where. Caine was also pretty particular about the look and feel of the shirts, and worked closely with Blue Collar Press to determine what kind they should be. “Blue Collar was really good about that – I love the shirts we print on,” Caine says. The quality and the price point on those shirts, he continues, allows the bookstore to make their margins and sell the tees for ten dollars less than similar-quality apparel from other places. It's the tote bags, though, that really demonstrate what The Raven is all about. 715 simultaneously promotes itself & local arts scene with uniquely original idea. While awards are impressive and bring notice, the European-style restaurant and bar has really made its bones by paying attention to the little details, and changing with the wants and desires of its customers since it opened in the fall of 2009. 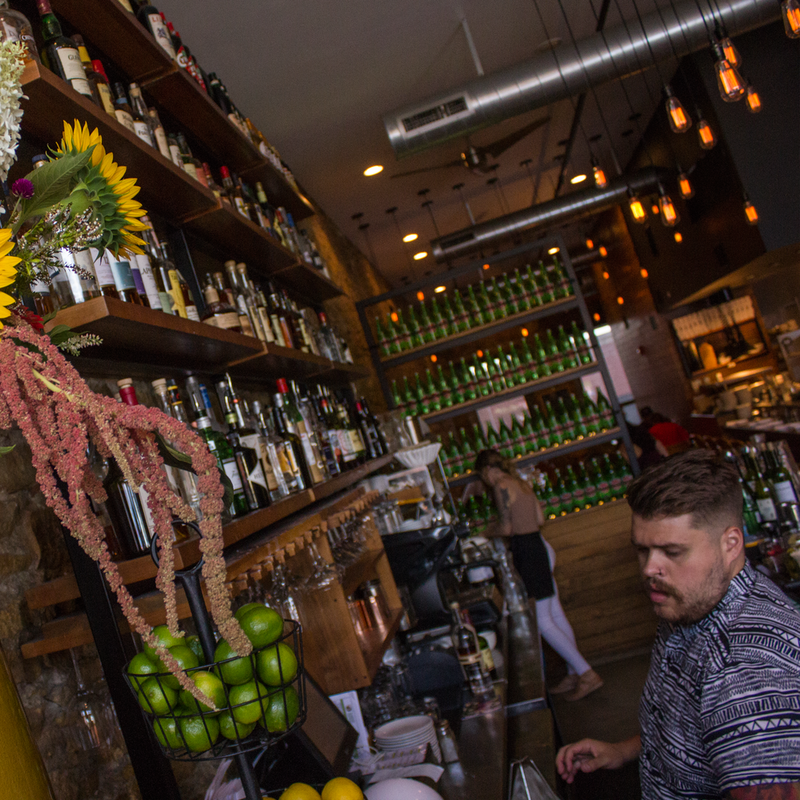 According to Matt Hyde, manager and part owner of 715, the restaurant has evolved over time, depending on both what the owners have felt like and what the guests are in the mood for. He points out the current 715 menu as an example. 715's bar manager Katrina Weiss swaps out her cocktails not just four times a year, because it'll still be summer at the beginning of September, explains Hyde. They never set a date – the folks at the restaurant just look at the forecast and plan accordingly. Case in point: the day we were talking, it was sweltering hot out, and thanks to a suggestion from Twitter, they were making sangria. As 715 has aged, the way the restaurant presents itself has changed somewhat. When they first opened , they had several different t-shirts available for purchase, and they were prominently displayed above the host station by the front door. “We had some for the staff, and people asked about them, so we sold a few of those,” Hyde says of early merchandising for the restaurant. However, merchandise never really became a solid thing for 715 – he says they probably still have a bunch of shirts in storage – so, they've pivoted in terms of what they do to promote themselves, and it's quite novel. Hyde has been part of the Lawrence arts scene for years – his first restaurant job was washing dishes at the former downtown institution, Tellers, because he needed a flexible schedule to be involved with music things (he helped found the Lawrence record label, Lotuspool, in the early '90s). The building in which 715 sits was Silverworks, a jeweler, which was around for nearly 30 years, so Hyde says that's a way to maintain a connection to the history of the building, as well as the present of the arts scene in Lawrence. The coasters feature work by local artists, and with the assistance of Alicia Kelly, the curated series has an image of a piece on one side, with a brief explanation of it, along with biographical details and contact information on the reverse. It's simple, but it's different, and it's definitely far more interesting to see artwork – especially, say, artist John Niswonger's image of Leatherface from The Texas Chainsaw Massacre rendered in stained glass – as opposed to the restaurant's logo or yet another Budweiser advertisment. “Just trying to hit the arts, because we don't have art displayed on the walls,” Hyde says, pointing to the bare stone of the south wall, and the plain, painted north. “We wanted to have a way to get the word out about artists. There's also a poetry installment coming soon, curated by the Raven Bookstore's Danny Caine. Local musician and Raven employee Chris Luxem even suggested using compact discs as coasters, but the restaurant will be sticking with the thick, hefty coasters they've been getting from Blue Collar. As Hyde points out, these four-inch by four-inch squares are pretty much ready for display, as is. It's great, Hyde says, because the 715 staff sees older women in their 60s and 70s quietly sneaking coasters into their purses when they think nobody's looking, but he assures everyone that they're meant to be taken. Hyde points to any number of art openings, concerts, readings, and multiple other events taking place in Lawrence on any given night, and how great it is that 715 gets to be a part of that on the regular. He hopes that the coasters can give back a small amount of that joy to community.